From a Home screen, navigate: Apps > Settings > More networks. These instructions apply to Standard mode only. Tap the Menu icon (located in the upper-right). If the option is unavailable, tap the switch to turn on Mobile Hotspot. Tap the Password field then enter the preferred password. 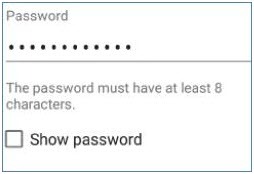 Password must be at least 8 characters, see example image below. Tap Show password to view the entered password. The new password must be entered on the connecting device.